Acronis 11.5: Reboot the computer automatically after the backup is finished ???? I've previously used Acronis True Image Echo Workstation 8.0. I've moved to Acronis Backup 11.5 (on a new machine). In True image, this was a _really_ good option under "Additional settings": "Reboot the computer automatically after the backup is finished"
I don't see this in Backup 11.5. Am I missing something? Is it possible to make this happen somehow with a setting I can't find. It's really, really useful in True Image (e.g. you can set a backup going overnight/unattended, the backup finishes, the machine reboots back into Windows, and gets on with its scheduled jobs). OK, that's great. Thanks. Could you point me to some documetation (pdf or online) showing how I can put a post-backup script in place. During backup plan creation you can specify it in plan's options (link in the bottom of the page) pre/post backup command page. The ability to create a backup plan (with pre & post options) seems to be only available in Windows client (and not in the bootable media version and not the F11 startup recovery manager). It’s the same for the ability to change the default options. Is this correct? In bootable media there is such option - "Restart the machine automatically after backup is finished " - http://www.acronis.com/en-us/support/documentation/AcronisBackup_11.5/#1272.html . It shouls be on 'additional settings' page or you can find it in the options dialog if you enter 'restart' in the search box above options tree. I am sorry, but I cannot see an option "Restart the machine automatically after backup is finished" in the bootable media version of Acronis back in "Additional settings". 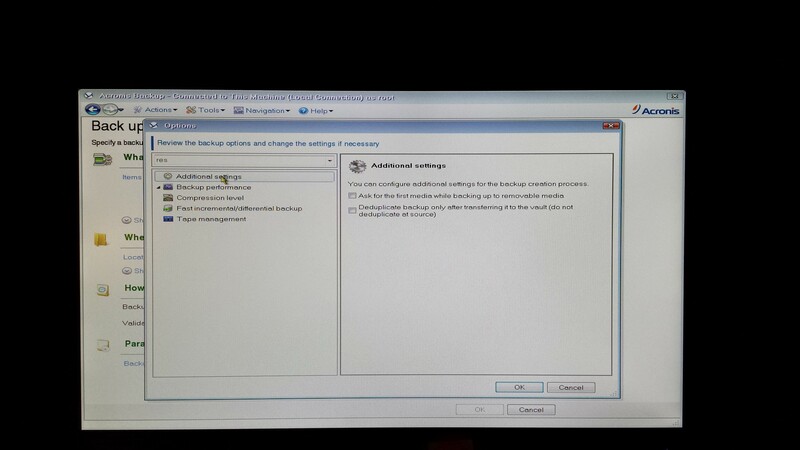 I have attached a photo of the "Additional settings" screen from bootable media. I also tried to search for the word "restart" in the search box, but it only gives me the "additional settings" page and I cannot see the word "restart" on there. The search box is saying it is under "Additional settings" but it is not showing when you click on "Additional settings". "Restart the machine automatically after backup is finished" is given in the help file also. I have tried 32- and 64-bit, but no difference. I checked and apparently it was removed before ABR11 RTM (build 17217) because with this option turned on machine restarted before cataloging was completed and incomplete information appeared in 'data view'. Backup itself was created consistent. In command-line tool this options was not dropped http://www.acronis.com/en-us/support/documentation/AcronisBackup_11.5/#11902.html , you can check it if you don't mind typing all it each time or if you can invoke it remotely from other machine. first you have to prevent shutdown to prevent an early shutdown. try this, enable prevent shutdown in machine options > additional settings. add a shutdown/restart post command to backup options via a batch file. in this fashion I am not sure it will work as I haven't tested it but at the end of a scheduled task batch file I use to wake the machine I have added shutdown /s. with this task acronis runs a backup, validates, replicates and shutsdown, completing fully before doing so. Thanks for the helpful comments. It looks like it's going to be problematic. It's a shame the functionality seems to have disappeared. Hi Allan. I've created an enhancement to bring the "Shut down the computer after the backup is complete" feature back to the product. However cannot commit that it will happen in the next version of Acronis Backup. After a work day you don't shut down the computer and go home. Acronis Backup will start the evening backup task and after it completeness will shut the computer down. However you you talk about "reboot after backup" no "shut down". I see that this option is valid only when you perform a backup from a bootable media. However it is a very rare case for regular use. Could you please clarify from your experience - why do you create backups from a bootable media but not from Windows? This is great news; thank you! a) I use bootable media for backup in a very small number of times (not very often!). I was exploring bootable media because I thought it had the reboot options that I used in the past, but could not find in the new version. b) I usually do all my backups from F11 startup recovery manager. In Acronis True Image Echo Workstation 8.0, there was an option: "Additional settings": "Reboot the computer automatically after the backup is finished" which is not available in Acronis Backup 11.5. I was looking for reboot. Usually, I set my backups in the evening. When the backup is finished (usually planned for about 2300), the machine reboots into Windows, and runs several scheduled jobs around 0100 and later. Hi Allan, thank you for your reply. However I still did not get your particular use case - why you create backups using various types of pre-bootable environment (like bootable media or F11 Startup Recovery Manager) but not schedule backups in Windows. I would appreciate it you make it clear for me.
!) I scheduled backups in Acronis Backup (just once). 2) Every day after I finished my work on the machine it starts creating backups (automatically). 3) It does not need to reboot in Windows since it *is* in Windows. After I scheduled backup (it performed just once) I can "forget" about backup maintenance until some kind of disaster or data loss. I prefer to take a backup outside Windows, or before Windows starts (that's why I boot from F11 Startup Recovery Manager). I understood that if Windows is running, it may have files open or in a state of change, so taking a backup from within Windows while it is running may affect the backup. I have had disks fail on me twice (on different machines). I have been able to replace the disk, then reinstall from an Aconris disk image, and been back up running in a couple of hours. I have also had to replace the motherboard on another machine and done the same thing. In short, I prefer to back up a disk outside of Windows (or without Windows running). Thank you for the clarification. Actually this is what I expected to hear, however I needed the confirmation from you. I will put your notes to the triage regarding the "reboot to Windows" option. But still I want to assure you that you should not fear "files open or in a state of change". You may know that all Acronis backup products more than 10 years already use the unique (first introduced in Acronis) technology of disk snapshot. Files open or in a state of change mean that this "changing" information is in RAM or in some temp files (e.g. *.~* ones). During backup Acronis Backup does not touch RAM at all and only information from disk is backed up. If during backup some information will attempt to write to a HDD you still should not fear that some of your files will be backed up inconsistently (e.g. beginning of a file - in old condition and the second half with the new information). In such cases with thanks to the snapshot the disk sectors to be changed will be backed up first and only then the new information will be allowed to write to the HDD. So, briefly - everything you had on a disk will be backed up consistently. Everything from RAM will not be included to the backup at all. Believe me, most probably because of this revolutionary technology the previously small Acronis company in just a few years became a competitor to Symantec products. Just because backup of production servers with snapshot can be taken while you still work in Windows (no reboot required). This snapshot standard is proven by many years and big customers as well. My reason for wanting a reboot after backup is very, very plain vanilla: I like the shutdown after backup option. But, I'd just like to have my computer already running when I sit down to get started the next day. If I may turn your question around a bit. If you have a shutdown option--one that shuts down AFTER the backup verification process is completed--why wouldn't you have a shutdown and reboot option? Why couldn't that be added just because some customers are slightly crazy and they like it that way? Thank you for sharing your feedback! What Acronis product are you using? Acronis Backup 11.7 is currently in the Extended support phase, which means only critical hotfixes/patches are provided for this product. I've registered your feedback in our internal system, so that the product management can consider it for future changes in Acronis Backup 12.5.